First, a disclaimer: Bob Corritore is a personal friend of mine, and I've just completed his official website. So it's possible that I may be a little biased in selecting All-Star Blues Sessions as this month's Pick Hit. But one listen to the wonderful collection of tracks on this CD will convince you that this would be the top choice even if I had never met Mr. Corritore. With cuts from artists like Bo Diddley, Jimmy Rogers, Nappy Brown, Robert Jr. Lockwood, R.L. Burnside, Lil' Ed and others, this disc will undoubtedly rank as one of the year's best. Corritore is the co-owner and entertainment director of The Rhythm Room in Phoenix, one of the country's premier blues clubs. He also hosts a weekly blues show on the local public radio station, and is an accomplished harmonica player. Throughout the last dozen years, Corritore has frequently taken many of the blues legends appearing at the Rhythm Room and other Phoenix area clubs into the studio to record with local backing musicians, including himself. All-Star Blues Sessions is the result of these forays into the studio, and serious blues fans will revel in hearing this collection of tunes. The names of the special guests will be familiar to even the most casual of blues fans. The music is all of very high quality, as Corritore and the backing musicians seem to draw the best out of each star. By the same token, the opportunity to record with his heroes helps elevate Corritore's harp playing to another level. That's especially evident on the opening cut, where he plays excellent chromatic harmonica behind Lil' Ed's "Hip Shakin'." The same is true of the instrumental number "Naptown Blues," which also features wonderful guitar work from Robert Jr. Lockwood and fine, jazzy organ from local sideman Eddie Hollis. "Naptown Blues" is one of the album's better cuts. While most blues lovers will be drawn to this CD by the legendary artists found here, one of real treats is the sterling guitar accompaniment of local Phoenix sideman Johnny Rapp. His playing holds up to, and sometimes surpasses, that of the better-known guitarists. Pay close attention to Rapp's lead work on Chico Chism's "Five Long Years," King Karl's "Cool Calm Collected" (a remake of his Excello hit from 40 years ago), and Jimmy Dotson's "Tired Of Being Alone." Black Top recording artist Rusty Zinn also sneaks in a tasteful guitar solo on the King Karl tune. Other highlights include the three numbers from Baton Rouge pianist Henry Gray, the only artist to be featured on more than two songs. The most notable is a cover of "How Many More Years," recorded originally by one of Gray's former bandleaders, Howlin' Wolf. Former Muddy Waters guitarist Bob Margolin guests on the other two Gray numbers, "Everybody's Fishin'" and "Showers Of Rain." Another former Wolf band member and an Arizona blues legend, drummer Chico Chism, sounds good with his raspy vocals on a version of "I Had My Fun." Chism is also featured on the aforementioned "Five Long Years," which includes a piano solo from Pinetop Perkins. The biggest name on the album, Bo Diddley, contributes a nice, loping country blues on his own "Little Girl," while one of the lesser-known guests, the late Clarence Edwards, does a raw, rambunctious blues in "Hear That Rumblin'." Other artists featured on the CD include the legendary Jimmy Rogers with a version of his own "Out On The Road," Mississippi Delta guitarist R.L. Burnside with the very deep blues "Goin' Down South," and Phoenix multi-instrumentalist Dino Spells performing an original number "Jennie Bea." All-Star Blues Sessions closes with a very earthy version of "Nappy's Driftin' Blues" from frequent Rhythm Room visitor Nappy Brown, backed by Kid Ramos on guitar. Great blues performers in a sympathetic setting with top-notch sidemen ... what's not to like about this CD? If I need to find something about which to complain, it's the lack of a song list on the back insert of the CD, which means you need to open up the jewel case to read what's on the disc. But that's a very minor gripe, and is more a byproduct of my years as a radio deejay. I'll conclude this review with one more shameless plug for Bob's web site, designed and developed by yours truly. 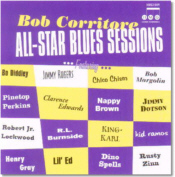 It's packed with a complete Bob Corritore discography and lots of vintage blues photos. All contents Copyright � 1999, Blue Night Productions. All rights reserved.